Update 7/26/11:The seller of this car contacted me, the vin is 10121*380352. Anyone know any information on previous owners etc? Check out this cool YouTube of it in action! From 3/24/11: Giulia SS. This car is available now from Classic Car dot com. It is described as a 1964 Giulia but no vin is stated. Anyone know which car this is? Asking price is 60,000 Euro’s (about $85,000 on 3/24/11). Description states the seller converted it to race spec -I wonder if it comes with the stock components that were removed? Learn more about the Sprint Speciale here. The Giulia SS register is here. I like this color a lot. Fog light placement is interesting -I was going to put fog lights on mine, but use the bumper bracket mounts. Wheels are period magnesium items. Low and made lower by cornering. Does anyone know who sells the sliding windows? Vroom. Looks to be a later valve cover. Tough to say much about the engine from this picture. Advert description: “When the Alfa-Romeo Giulia was launched in 1962, the top of the line Sprint Speciale, or SS was only an evolution of the Giulietta. Unlike its siblings, it did not benefit from the latest redesign, keeping untouched lines from the previous Alfa Romeo models with an engine displacement increased from 1,300 cc to 1,600 cc. The SS, as well as the Spider which also kept the Giulietta’s lines, were both discontinued in 1964. 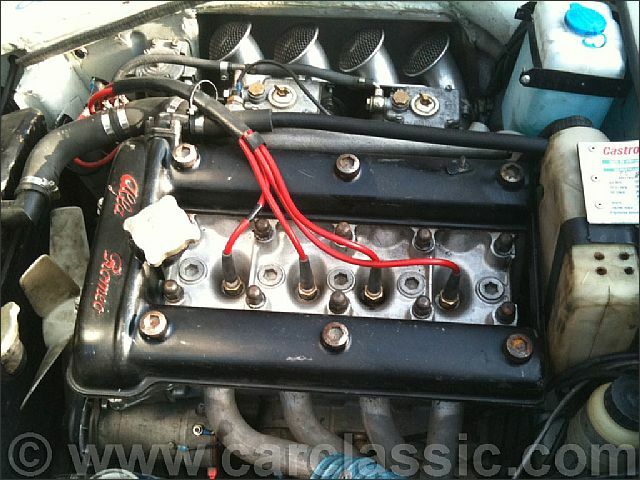 The Alfa-Romeo Giulia SS we are happy to offer for sale is one of these latest examples. Built in 1964, the current owner decided to turn it into a race car. 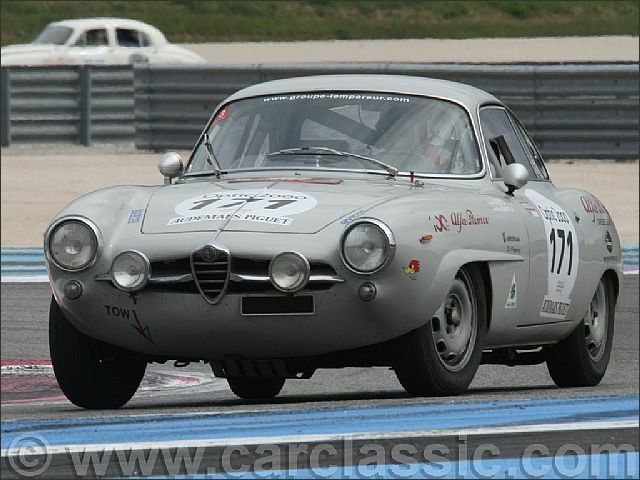 As a matter of fact, the Giulia SS is eligible in most major historical races. 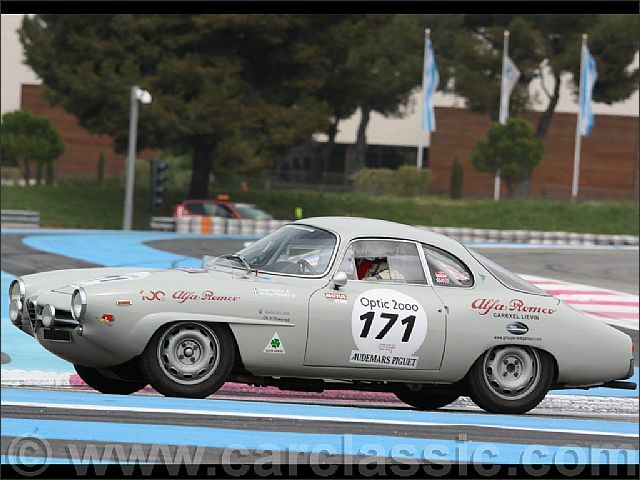 This Alfa Romeo Giulia SS was entered 5 times in the French Tour Auto, once in the Tour de l’Aisne as well as several other endurance races. Fully converted to racing specifications, this Giulia SS is the ideal vehicle to enter a Tour Auto and other historical rallies. The engine develops 130 hp thanks to Weber carburetors and power goes to the ground through a reinforced clutch, a 5-speed gearbox and a limited slip differential. Coming with 8 wheels, this Alfa-Romeo Giulia SS is equipped with magnesium rims and a set of brand-new 15” Michelin. Got a hankering for a Giulia SS racer? There are a few about these days. I wonder if street car prices will eventually see cars like this converted back to street specification? This entry was posted in 10121 Giulia, 2011 markets, Giulietta & Giulia Market, Race cars, Sprint Speciale's and tagged Alfa Romeo, Classic cars, Sprint Speciale by Hamilton. Bookmark the permalink.